Renters make up a large proportion of our southeast neighbors. In fact, renter-occupied units in the SE Uplift Coalition area range from approximately 20% and 25% in neighborhoods like Woodstock and Brentwood-Darlington, to as high as 85% in places like Buckman and Kerns. Renters are a unique demographic in that most of us have been, or are currently, a renter. Additionally, the demographics of renters vary significantly. One could dig into the demographics by age, gender, race, family status, and income to find strikingly different stories and circumstances within. CAT has many accomplishments, but their most recent accomplishment was their advocacy in support of Senate Bill 608. SB 608 quickly moved through the Oregon Legislature this winter with the purpose of addressing housing injustice and improving housing stability through statewide policy change. In passing, this new law will limit the number and percentage of rent increases imposed on tenants per year and put an end to no cause evictions. With the passage of SB 608, CAT and other housing partners have made huge headway in their efforts to protect the most vulnerable renters in our communities. To learn more about CAT’s programs, accomplishments, and to read member stories, go here. In the meantime, there is more work to do to end housing injustice for all. Interested in taking action? See recommendations below. Many Neighborhood Associations have reached out to SE Uplift, the Office of Community and Civic Life, and each other for advice and recommendations on how to engage renters in their neighborhoods. If you are a Neighborhood Association interested in engaging more renters in your community, start by reaching out to your SE Uplift liaison. SE Uplift is working with CAT to support their efforts and provide additional capacity on this topic to our neighborhoods. 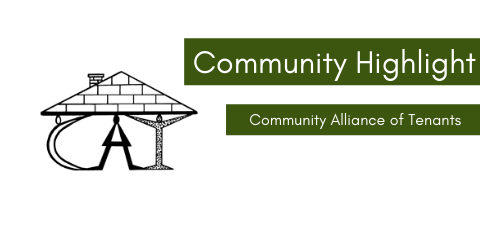 If you are a renter, homeowner, or a landlord that believes in the mission of CAT and justice in housing, all are invited to be members and support their great work!